Choosing any baby product is very tough for the parents. A lot of questions and confusion could arise in their mind. The same headache can also happen in buying a double stroller. Don’t worry. Babystrollerhome is here to help you. We will answer all arising questions and help you to buy the best double stroller for your baby. Before going to question-answer part, we want to reveal the process of finding the questions first. This is actually necessary and you will understand the importance of this post if you know the process. The full credit goes to our team members. They do the hard work of selecting questions. First, we search in the web about questions regarding double stroller that is commonly asked by parents and users. We also ask parents, baby doctors and baby specialist about the confusion and questions regarding double baby jogging stroller and take their note in the sheet. After collecting questions, we arrange a meeting with baby experts to select the best questions from the list. The discussion takes 4-5 hours to make the final list of questions. Do I need a double stroller? Do I want side by side or stadium-style seating? Do I want to go jogging with my stroller? Will this double stroller fit in my car? So, now we will discuss the main portion of this writing – the answer part. Let’s check that. 1. Do I Need A Double Stroller? It is the most common questions. Actually, there are two situations when you will need a double stroller. Situation No 1: The first situation is very common to all. And the answer is that If you have twins, you should go for it. Why? It is next to impossible to control your twin babies in a normal stroller. So, do not waste your money on a single stroller. It has a lot of other benefits also. You can take care of your twins together without hassle with this. As a mother of twins, it will be very hard to do your household work and manage your baby twins at the same time. But a double stroller can solve your problem; just keep your twins in the double stroller and do your household work freely. Situation No 2: It is also common, but people do not take it seriously. The situation happens when you have two babies – one is 2-3 years old another one is 6 months old. A double stroller can help you out from this situation. You can take care of both of your kids in the same stroller at the same time. And it saves your money also. Though double stroller is big and heavy, if you want to get long-term benefits, there is no alternative to this. 2. Do I want side by side or stadium-style seating? There are mainly two types of double stroller available in the market. One is side by side or twin stroller. And another one is stadium style or tandem strollers. A description of both will help you to choose yours. Side by side double stroller: In side by side/twin stroller, there are two seats next to each other. From the structure, it is easily understandable that these type of strollers are wider than the normal one. So twin stroller takes much wider space also, and that sometimes can create a problem to go through doorways or narrow space. But it has some great benefits also. Here your kids sit next to each other, so they can see each other, talk and play as well. So, the kids are an arm’s reach from the mother. Stadium-style double stroller: In the stadium-style stroller, the seats are one behind the other. So it is big in lengthwise and normal from wide. So, no such problem to go through doorways. It will take little space and can fit in a small room also. 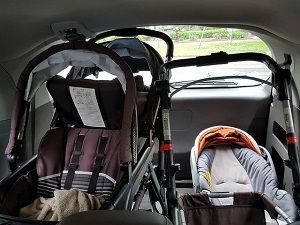 The baby will seat one behind another, so there will be little attachment between them. That’s why we personally recommend side by side stroller. 3. Do I want to go jogging with my stroller? It is not a great idea to go for jogging with your double stroller expect this one – All-Terrain Double Strollers. It is a sports type stroller that fits for walking, but many models are great for jogging. There are a number of reasons behind our statement of not jogging with a double stroller. Please check those reasons for better understandings. The first reason behind our suggestion is that double stroller is too heavy to go for jogging. So, it will not be possible for a single person to go for walks with this weighty one with two kids sitting on the stroller. We can’t even think of it. There are no such gripping facilities in the double stroller also. So, the controlling can be difficult in broken and soil roads. Moreover, it is risky too. And most importantly, your children will not fill comfortable also. So, please use double baby jogging stroller instead of a double stroller for jogging and walking purpose. 4. Will this double stroller fit in my car? Yes, most of the double strollers will fit in your car but can take more space than a normal one. Side-by-Side / Twin Strollers: We all know that It is wider than other double strollers, that’s why take two car seats to fit in the car. 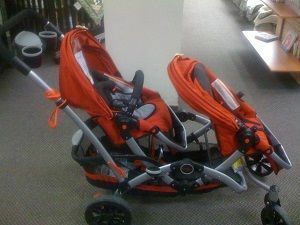 Tandem Strollers: Many models of this is ideal for car also. You just have to pick carefully. All-Terrain Double Strollers: Most of the model of it occupies one car seat, not two. From this, we can tell that double strollers can fit in the car. So, don’t worry about this. Just be careful before buying. We hope and pray that the answers of the following questions will help you to take the right decision in buying a double stroller. Please let us know if you have any further questions regarding this. Our team is always here to answer your query.